11 A None No Power Seat 11 A is an Open Suite style Business Class seat located at a bulkhead and offering a seat that transforms into a fully-flat bed. A bassinet may be attached to the bulkhead for a passenger traveling with an infant. The seat is angled towards the window providing additional privacy. The proximity to the galley and lavatory area might be bothersome. 11 E None No Power Seat 11 E is an Open Suite style Business Class seat located at a bulkhead and offering a seat that transforms into a fully-flat bed. The seat is located at a bulkhead and is angled towards the adjacent seat. The seat and the one adjacent are ideal for couples traveling together. The proximity to the galley and lavatory area might be bothersome. 11 F None No Power Seat 11 F is an Open Suite style Business Class seat located at a bulkhead and offering a seat that transforms into a fully-flat bed. The seat is located at a bulkhead and is angled towards the adjacent seat. The seat and the one adjacent are ideal for couples traveling together. The proximity to the galley and lavatory area might be bothersome. 11 K None No Power Seat 11 K is an Open Suite style Business Class seat located at a bulkhead and offering a seat that transforms into a fully-flat bed. A bassinet may be attached to the bulkhead for a passenger traveling with an infant. The seat is angled towards the window providing additional privacy. The proximity to the galley and lavatory area might be bothersome. 12 A None No Power Seat 12 A is an Open Suite style Business Class seat offering a seat that transforms into a fully-flat bed. The seat is angled towards the window providing additional privacy. 12 E None No Power Seat 12 E is an Open Suite style Business Class seat offering a seat that transforms into a fully-flat bed. The seat is angled towards the adjacent seat. The seat and the one adjacent are ideal for couples traveling together. 12 F None No Power Seat 12 F is an Open Suite style Business Class seat offering a seat that transforms into a fully-flat bed. The seat is angled towards the adjacent seat. The seat and the one adjacent are ideal for couples traveling together. 12 K None No Power Seat 12 K is an Open Suite style Business Class seat offering a seat that transforms into a fully-flat bed. The seat is angled towards the window providing additional privacy. 14 A None No Power Seat 14 A is an Open Suite style Business Class seat offering a seat that transforms into a fully-flat bed. The seat is angled towards the window providing additional privacy. 14 E None No Power Seat 14 E is an Open Suite style Business Class seat offering a seat that transforms into a fully-flat bed. The seat is angled towards the adjacent seat. The seat and the one adjacent are ideal for couples traveling together. 14 F None No Power Seat 14 F is an Open Suite style Business Class seat offering a seat that transforms into a fully-flat bed. The seat is angled towards the adjacent seat. The seat and the one adjacent are ideal for couples traveling together. 14 K None No Power Seat 14 K is an Open Suite style Business Class seat offering a seat that transforms into a fully-flat bed. The seat is angled towards the window providing additional privacy. 15 A None No Power Seat 15 A is an Open Suite style Business Class seat offering a seat that transforms into a fully-flat bed. The seat is angled towards the window providing additional privacy. 15 E None No Power Seat 15 E is an Open Suite style Business Class seat offering a seat that transforms into a fully-flat bed. The seat is angled towards the adjacent seat. The seat and the one adjacent are ideal for couples traveling together. 15 F None No Power Seat 15 F is an Open Suite style Business Class seat offering a seat that transforms into a fully-flat bed. The seat is angled towards the adjacent seat. The seat and the one adjacent are ideal for couples traveling together. 15 K None No Power Seat 15 K is an Open Suite style Business Class seat offering a seat that transforms into a fully-flat bed. The seat is angled towards the window providing additional privacy. 16 A None No Power Seat 16 A is an Open Suite style Business Class seat offering a seat that transforms into a fully-flat bed. The seat is angled towards the window providing additional privacy. 16 E None No Power Seat 16 E is an Open Suite style Business Class seat offering a seat that transforms into a fully-flat bed. The seat is angled towards the adjacent seat. The seat and the one adjacent are ideal for couples traveling together. 16 F None No Power Seat 16 F is an Open Suite style Business Class seat offering a seat that transforms into a fully-flat bed. The seat is angled towards the adjacent seat. The seat and the one adjacent are ideal for couples traveling together. 16 K None No Power Seat 16 K is an Open Suite style Business Class seat offering a seat that transforms into a fully-flat bed. The seat is angled towards the window providing additional privacy. 17 A None No Power Seat 17 A is an Open Suite style Business Class seat offering a seat that transforms into a fully-flat bed. The seat is angled towards the window providing additional privacy. 17 E None No Power Seat 17 E is an Open Suite style Business Class seat offering a seat that transforms into a fully-flat bed. The seat is angled towards the adjacent seat. The seat and the one adjacent are ideal for couples traveling together. 17 F None No Power Seat 17 F is an Open Suite style Business Class seat offering a seat that transforms into a fully-flat bed. The seat is angled towards the adjacent seat. The seat and the one adjacent are ideal for couples traveling together. 17 K None No Power Seat 17 K is an Open Suite style Business Class seat offering a seat that transforms into a fully-flat bed. The seat is angled towards the window providing additional privacy. 18 A None No Power Seat 18 A is an Open Suite style Business Class seat offering a seat that transforms into a fully-flat bed. The seat is angled towards the window providing additional privacy. The proximity to the galley area might be bothersome. 18 E None No Power Seat 18 E is an Open Suite style Business Class seat offering a seat that transforms into a fully-flat bed. The seat is located at a bulkhead and is angled towards the adjacent seat. The seat and the one adjacent are ideal for couples traveling together. The proximity to the galley area might be bothersome. 18 F None No Power Seat 18 F is an Open Suite style Business Class seat offering a seat that transforms into a fully-flat bed. The seat is located at a bulkhead and is angled towards the adjacent seat. The seat and the one adjacent are ideal for couples traveling together. The proximity to the galley area might be bothersome. 18 K None No Power Seat 18 K is an Open Suite style Business Class seat offering a seat that transforms into a fully-flat bed. The seat is angled towards the window providing additional privacy. The proximity to the galley area might be bothersome. 19 A None No Power Seat 19 A is an Open Suite style Business Class seat offering a seat that transforms into a fully-flat bed. The seat is angled towards the window providing additional privacy. The proximity to the galley area might be bothersome. 19 K None No Power Seat 19 K is an Open Suite style Business Class seat offering a seat that transforms into a fully-flat bed. The seat is angled towards the window providing additional privacy. The proximity to the galley area might be bothersome. 31 A None No Power Seat 31 A is a standard Economy Class seat that might feature additional legroom due to the location at a bulkhead. A bassinet might be attached to the bulkhead for a passenger traveling with an infant. The tray table and inflight entertainment monitor are installed in a fixed armrest, therefore, seat width is slightly reduced. Floor storage for personal items is not available during takeoff and landing. The proximity to the galley area might be bothersome. 31 B None No Power Seat 31 B is a standard Economy Class seat that might feature additional legroom due to the location at a bulkhead. A bassinet might be attached to the bulkhead for a passenger traveling with an infant. The tray table and inflight entertainment monitor are installed in a fixed armrest, therefore, seat width is slightly reduced. Floor storage for personal items is not available during takeoff and landing. The proximity to the galley area might be bothersome. 31 C None No Power Seat 31 C is a standard Economy Class seat that might feature additional legroom due to the location at a bulkhead. A bassinet might be attached to the bulkhead for a passenger traveling with an infant. The tray table and inflight entertainment monitor are installed in a fixed armrest, therefore, seat width is slightly reduced. Floor storage for personal items is not available during takeoff and landing. The proximity to the galley area might be bothersome. 31 D None No Power Seat 31 D is a standard Economy Class seat that might feature additional legroom due to the location at a bulkhead. A bassinet might be attached to the bulkhead for a passenger traveling with an infant. The tray table and inflight entertainment monitor are installed in a fixed armrest, therefore, seat width is slightly reduced. Floor storage for personal items is not available during takeoff and landing. The proximity to the galley area might be bothersome. 31 E None No Power Seat 31 E is a standard Economy Class seat that might feature additional legroom due to the location at a bulkhead. A bassinet might be attached to the bulkhead for a passenger traveling with an infant. The tray table and inflight entertainment monitor are installed in a fixed armrest, therefore, seat width is slightly reduced. Floor storage for personal items is not available during takeoff and landing. The proximity to the galley area might be bothersome. 31 F None No Power Seat 31 F is a standard Economy Class seat that might feature additional legroom due to the location at a bulkhead. A bassinet might be attached to the bulkhead for a passenger traveling with an infant. The tray table and inflight entertainment monitor are installed in a fixed armrest, therefore, seat width is slightly reduced. Floor storage for personal items is not available during takeoff and landing. The proximity to the galley area might be bothersome. 31 H None No Power Seat 31 H is a standard Economy Class seat that might feature additional legroom due to the location at a bulkhead. A bassinet might be attached to the bulkhead for a passenger traveling with an infant. The tray table and inflight entertainment monitor are installed in a fixed armrest, therefore, seat width is slightly reduced. Floor storage for personal items is not available during takeoff and landing. The proximity to the galley area might be bothersome. 31 J None No Power Seat 31 J is a standard Economy Class seat that might feature additional legroom due to the location at a bulkhead. A bassinet might be attached to the bulkhead for a passenger traveling with an infant. The tray table and inflight entertainment monitor are installed in a fixed armrest, therefore, seat width is slightly reduced. Floor storage for personal items is not available during takeoff and landing. The proximity to the galley area might be bothersome. 31 K None No Power Seat 31 K is a standard Economy Class seat that might feature additional legroom due to the location at a bulkhead. A bassinet might be attached to the bulkhead for a passenger traveling with an infant. The tray table and inflight entertainment monitor are installed in a fixed armrest, therefore, seat width is slightly reduced. Floor storage for personal items is not available during takeoff and landing. The proximity to the galley area might be bothersome. 45 C None No Power Seat 45 C is a standard Economy Class seat. The proximity to the lavatory area might be bothersome. 45 D None No Power Seat 45 D is a standard Economy Class seat. The proximity to the lavatory area might be bothersome. 45 F None No Power Seat 45 F is a standard Economy Class seat. The proximity to the lavatory area might be bothersome. 45 H None No Power Seat 45 H is a standard Economy Class seat. The proximity to the lavatory area might be bothersome. 46 A None No Power Seat 46 A is a standard Economy Class seat located in a last row of the forward Economy Class cabin. Seat back recline might be limited due to the wall of the lavatory directly behind. Also, if the seat back in front is reclined, then personal space will be reduced. The proximity to the lavatory area might be bothersome. 46 B None No Power Seat 46 B is a standard Economy Class seat located in a last row of the forward Economy Class cabin. Seat back recline might be limited due to the wall of the lavatory directly behind. Also, if the seat back in front is reclined, then personal space will be reduced. The proximity to the lavatory area might be bothersome. 46 C None No Power Seat 46 C is a standard Economy Class seat located in a last row of the forward Economy Class cabin. Seat back recline might be limited due to the wall of the lavatory directly behind. Also, if the seat back in front is reclined, then personal space will be reduced. The proximity to the lavatory area might be bothersome. 46 D None No Power Seat 46 D is a standard Economy Class seat located in a last row of the forward Economy Class cabin. Seat back recline might be limited due to the wall of the lavatory directly behind. Also, if the seat back in front is reclined, then personal space will be reduced. The proximity to the lavatory area might be bothersome. 46 E None No Power Seat 46 E is a standard Economy Class seat located in a last row of the forward Economy Class cabin. Seat back recline might be limited due to the wall of the lavatory directly behind. Also, if the seat back in front is reclined, then personal space will be reduced. The proximity to the lavatory area might be bothersome. 46 F None No Power Seat 46 F is a standard Economy Class seat located in a last row of the forward Economy Class cabin. Seat back recline might be limited due to the wall of the lavatory directly behind. Also, if the seat back in front is reclined, then personal space will be reduced. The proximity to the lavatory area might be bothersome. 46 H None No Power Seat 46 H is a standard Economy Class seat located in a last row of the forward Economy Class cabin. Seat back recline might be limited due to the wall of the lavatory directly behind. Also, if the seat back in front is reclined, then personal space will be reduced. The proximity to the lavatory area might be bothersome. 46 J None No Power Seat 46 J is a standard Economy Class seat located in a last row of the forward Economy Class cabin. Seat back recline might be limited due to the wall of the lavatory directly behind. Also, if the seat back in front is reclined, then personal space will be reduced. The proximity to the lavatory area might be bothersome. 46 K None No Power Seat 46 K is a standard Economy Class seat located in a last row of the forward Economy Class cabin. Seat back recline might be limited due to the wall of the lavatory directly behind. Also, if the seat back in front is reclined, then personal space will be reduced. The proximity to the lavatory area might be bothersome. 48 A None No Power Seat 48 A is a standard Economy Class seat located in an Exit Row. There is additional legroom and additional personal space due to the lack of a seat directly ahead. However, the protrusion from the exit door might take away some of the additional legroom. The tray table and inflight entertainment monitor are installed in a fixed armrest, therefore, seat width is slightly reduced. Floor storage for personal items is not available for use during takeoff and landing. The proximity to the lavatory area might be bothersome. 48 B None No Power Seat 48 B is a standard Economy Class seat located in an Exit Row. There is additional legroom and additional personal space due to the lack of a seat directly ahead. The tray table and inflight entertainment monitor are installed in a fixed armrest, therefore, seat width is slightly reduced. Floor storage for personal items is not available for use during takeoff and landing. The proximity to the lavatory area might be bothersome. 48 C None No Power Seat 48 C is a standard Economy Class seat located in an Exit Row. There is additional legroom and additional personal space due to the lack of a seat directly ahead. The tray table and inflight entertainment monitor are installed in a fixed armrest, therefore, seat width is slightly reduced. Floor storage for personal items is not available for use during takeoff and landing. The proximity to the lavatory area might be bothersome. 48 H None No Power Seat 48 H is a standard Economy Class seat located in an Exit Row. There is additional legroom and additional personal space due to the lack of a seat directly ahead. The tray table and inflight entertainment monitor are installed in a fixed armrest, therefore, seat width is slightly reduced. Floor storage for personal items is not available for use during takeoff and landing. The proximity to the lavatory area might be bothersome. 48 J None No Power Seat 48 J is a standard Economy Class seat located in an Exit Row. There is additional legroom and additional personal space due to the lack of a seat directly ahead. The tray table and inflight entertainment monitor are installed in a fixed armrest, therefore, seat width is slightly reduced. Floor storage for personal items is not available for use during takeoff and landing. The proximity to the lavatory area might be bothersome. 48 K None No Power Seat 48 K is a standard Economy Class seat located in an Exit Row. There is additional legroom and additional personal space due to the lack of a seat directly ahead. However, the protrusion from the exit door might take away some of the additional legroom. The tray table and inflight entertainment monitor are installed in a fixed armrest, therefore, seat width is slightly reduced. Floor storage for personal items is not available for use during takeoff and landing. The proximity to the lavatory area might be bothersome. 49 C None No Power Seat 49 C is a standard Economy Class seat. The proximity to the lavatory area might be bothersome. 49 D None No Power Seat 49 D is a standard Economy Class seat that might feature additional legroom due to the location at a bulkhead. A bassinet might be attached to the bulkhead for a passenger traveling with an infant. 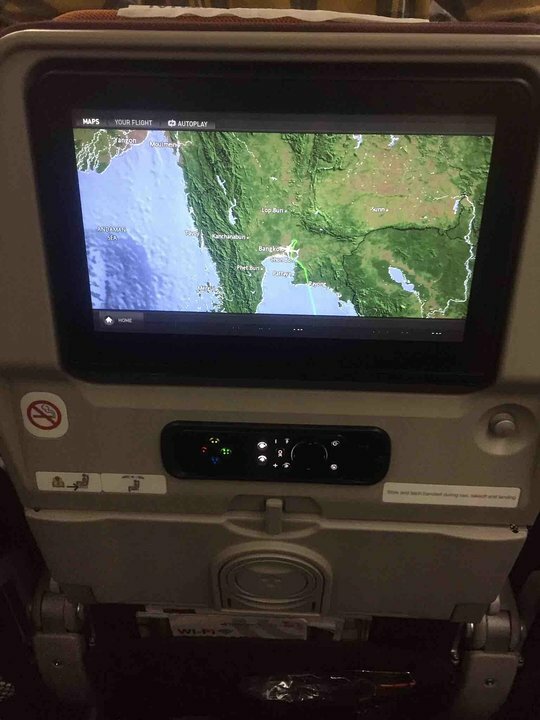 The tray table and inflight entertainment monitor are installed in a fixed armrest, therefore, seat width might be reduced. Floor storage for personal items is not available during takeoff and landing. 49 E None No Power Seat 49 E is a standard Economy Class seat that might feature additional legroom due to the location at a bulkhead. A bassinet might be attached to the bulkhead for a passenger traveling with an infant. The tray table and inflight entertainment monitor are installed in a fixed armrest, therefore, seat width might be reduced. Floor storage for personal items is not available during takeoff and landing. 49 F None No Power Seat 49 F is a standard Economy Class seat that might feature additional legroom due to the location at a bulkhead. A bassinet might be attached to the bulkhead for a passenger traveling with an infant. The tray table and inflight entertainment monitor are installed in a fixed armrest, therefore, seat width might be reduced. Floor storage for personal items is not available during takeoff and landing. 49 H None No Power Seat 49 H is a standard Economy Class seat. The proximity to the lavatory area might be bothersome. 60 C None No Power Seat 60 C is a standard Economy Class seat. The proximity to the galley and lavatory area might be bothersome. 61 B None No Power Seat 61 B is a standard Economy Class seat located in a last row of the aircraft. Seat back recline might be limited due to the bulkhead wall directly behind. Also, if the seat back in front is reclined, then personal space will be reduced. The proximity to the galley and lavatory area might be bothersome. 61 C None No Power Seat 61 C is a standard Economy Class seat located in a last row of the aircraft. Seat back recline might be limited due to the bulkhead wall directly behind. Also, if the seat back in front is reclined, then personal space will be reduced. The proximity to the galley and lavatory area might be bothersome. 61 D None No Power Seat 61 D is a standard Economy Class seat. The proximity to the galley and lavatory area might be bothersome. 61 E None No Power Seat 61 E is a standard Economy Class seat. The proximity to the galley and lavatory area might be bothersome. 61 F None No Power Seat 61 F is a standard Economy Class seat. The proximity to the galley and lavatory area might be bothersome. 61 H None No Power Seat 61 H is a standard Economy Class seat located in a last row of the aircraft. Seat back recline might be limited due to the bulkhead wall directly behind. Also, if the seat back in front is reclined, then personal space will be reduced. The proximity to the galley and lavatory area might be bothersome. 61 J None No Power Seat 61 J is a standard Economy Class seat located in a last row of the aircraft. Seat back recline might be limited due to the bulkhead wall directly behind. Also, if the seat back in front is reclined, then personal space will be reduced. The proximity to the galley and lavatory area might be bothersome. 62 D None No Power Seat 62 D is a standard Economy Class seat located in a last row of the aircraft. Seat back recline might be limited due to the bulkhead wall directly behind. Also, if the seat back in front is reclined, then personal space will be reduced. The proximity to the galley and lavatory area might be bothersome. 62 E None No Power Seat 62 E is a standard Economy Class seat located in a last row of the aircraft. Seat back recline might be limited due to the bulkhead wall directly behind. Also, if the seat back in front is reclined, then personal space will be reduced. The proximity to the galley and lavatory area might be bothersome. 62 F None No Power Seat 62 F is a standard Economy Class seat located in a last row of the aircraft. Seat back recline might be limited due to the bulkhead wall directly behind. Also, if the seat back in front is reclined, then personal space will be reduced. The proximity to the galley and lavatory area might be bothersome. Audio and Video onDemand is offered at every seat with over 30 movies and TV programs. Royal Silk Business Class features 16" seat back LCD screens and 11" seat back LCD screens in Economy Class. Wi-Fi is available through Panasonic Ku Satellite Band. Thai Airways Boeing 787-9 offers seating in two classes - Royal Silk Business Class featuring 30 Open Suite seats that transform into fully-flat beds and Economy Class featuring 268 standard seats equipped with personal seat back entertainment monitors. 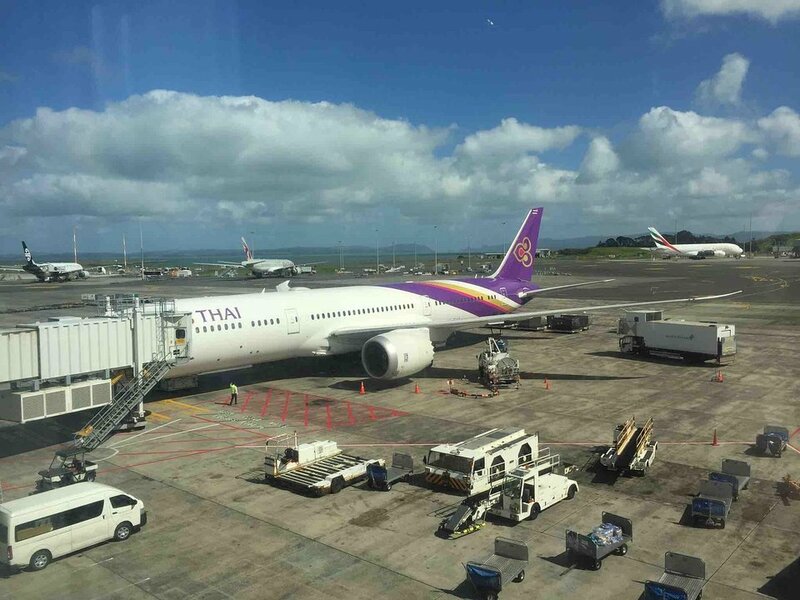 THAI flies 1 versions of Boeing 787-9.